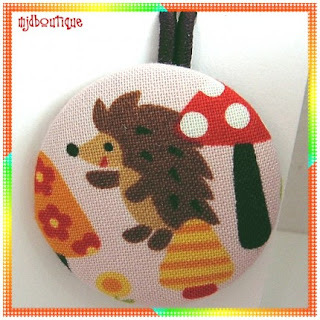 I was at Hannah Banana, my favorite local kids' consignment store, yesterday after my OB appointment (no induction this week, kids, apparently I dropped 5 lbs of water weight solely from my ankles last week so my doctor doesn't think I'm in danger of popping Jasper out yet) and bought some of these super duper cute fabric-covered button hairties. I am all about the hedgehog and the gnome. Aren't they adorable? Roo is still anti-hair accessory, preferring to channel cousin It with her mess of curls, so maybe I will just steal them for a bit. These are locally-made (go Wichita!) but you can get your own online at MJD Boutique's Etsy storefront. You rock and are definitely NOT my nemesis!!!! 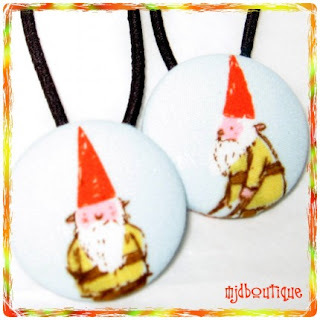 Thanks so much for your purchase AND for featuring me on your blog. I feel famous. :) I'm going to blog about you blogging me. How do you like that? Bwaahaaahaaa!